What a difference three years makes. In 1990, countless R&B songs that had been big hits in the US made little to no impact in Australia. By 1993, even the whiff of a new jack swing beat or four-part vocal harmonies was enough to send a song charging into the ARIA top 50. This week in 1993, one artist who'd been unfortunate not to see his US top 10 singles translate locally made up for lost time with his first (and only) Australia hit arriving on the singles chart. There was no change at the top this week in 1993, with "(I Can't Help) Falling In Love With You" by UB40 spending its fifth week at number 1. I have no recollection of this Grammy-nominated US top 10 single, which may be down to the fact that this was as far as Paperboy (real name: Mitchell Johnson) got in Australia. Big in New Zealand, with three top 10 hits under their belt already, Headless Chickens' blend of rock and electronic influences started to find an audience locally. Like its two predecessors, this latest UK top 10 was packed with samples (The Human League, Crown Heights Affair, Sylvester) but couldn't live up to the success of "Something Good". Iconic debut single "Supermodel (You Better Work)" hadn't reached the top 100 but this follow-up by the future Drag Race host, originally titled "Black To My Roots", peeked inside. Firmly establishing that "Achy Breaky Heart" had been a one-off, this lead single from Billy Ray Cyrus's second album bombed out here and in the US, where it only got one place higher. Here's another act failing to live up to past glories. 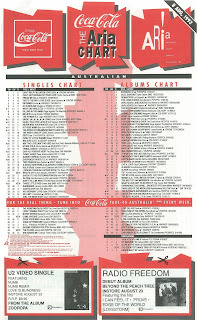 As "Killing In The Name" continued to rise inside the top 10, Rage Against The Machine stalled just outside the top 50 with their second single. "Rub You The Right Way". "My, My, My". "Fairweather Friend". 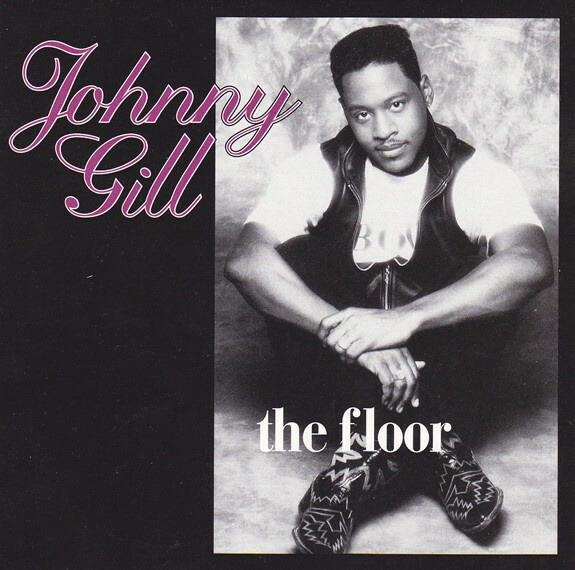 They were all excellent singles - two of them US top 10 hits - from Johnny Gill's self-titled previous album that had failed to make an impact in Australia. But the New Edition member made up for it with this lead release from fourth album Provocative. Like "Rub You...", "The Floor" was a slice of Jam & Lewis-produced R&B that had smash written all over it. 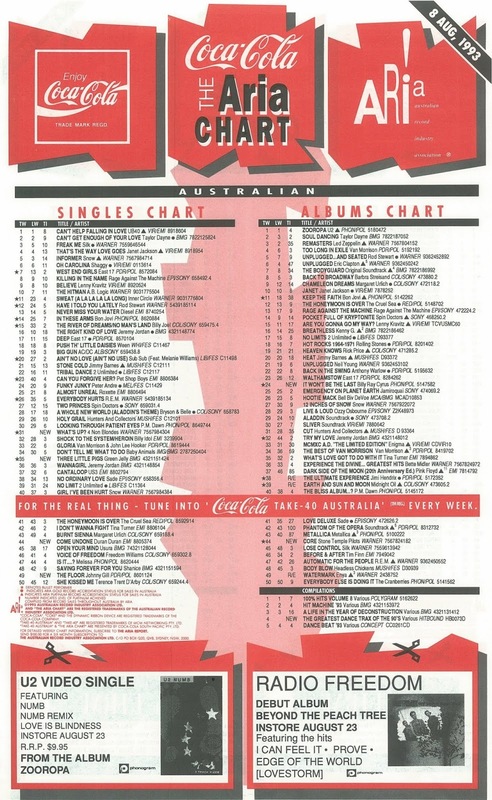 Interestingly, although "The Floor" made the ARIA top 10, it missed the mark in America, only reaching number 56. Johnny wouldn't return to the top 50 under his own steam, but we would see him on the chart again in 1996 as part of a six-piece New Edition. "Ordinary World" had been their best performing single in years, and the Duran Duran comeback continued with this second release from "The Wedding Album", which gave the British band consecutive top 20 hits for the first time since 1985's "A View To A Kill" and "Notorious" the following year. Continuing the more mature sound of their previous single, "Come Undone" evolved from a track Nick Rhodes and Duran Duran's then-guitarist Warren Cuccurullo thought might end up for a side-project they were considering, but instead became a last-minute inclusion on the album - and the band's last major worldwide hit. Combining two of my least favourite things - comedy records and heavy metal - this bastardised nursery rhyme was exactly the type of thing that would become a massive hit. American band Green Jelly had been going since 1981 (and still exist today), but with the success of this single had to change their name from their previous moniker, Green Jello, after a lawsuit from Kraft Foods, the makers of Jell-o. And that is all I have to say about this one-hit wonder, of whom my more rock-oriented readers will no doubt have fonder memories. Here's another big single I was none too enamoured with, although in the case of the only big hit for 4 Non Blondes, I can actually sit through the whole thing without needing to turn it off. Titled "What's Up?" despite not featuring those lyrics to avoid confusion with Marvin Gaye's "What's Going On? ", the track was written by frontwoman Linda Perry, who after the relatively rapid demise of this band, went on to become one of the most in-demand songwriters of the 2000s thanks to tracks like "Get The Party Started" for Pink and Christina Aguilera's "Beautiful". Next week: two acts still inside the top 10 register another hit on the top 50, including a song that'd be used as the theme to a long-running observational TV series. You're right, I do have fonder memories of "Three Little Pigs"! In 1993 there was no way for me to find out any more about Green Jelly and who the hell they were, apart from a single band photo printed in Smash Hits. I eventually got the CD of their video album Cereal Killer (although I later sold it) and the whole thing was full of wacky lyrical references and metal riffs. It's only half the experience without the claymation, though. "What's Up" is easily one of the worst songs of the '90s, right up there with Merril Bainbridge's Mouth, which she really should have kept shut! I always forget how 'Ditty' goes. I remember it appeared as a cassette-only (!) bonus track on '100% Hits Volume 9', I discovered when someone from my form at school had it on their walkman on the bus on a school excursion. #97 is stretching it a bit for a 'hit'. Never heard 'Mr Moon' before. 'Believe In Me' sounded probably a bit too 'hard' to be as successful as 'Something Good'. I heard 'Supermodel' at the time, and remember a biggish deal being made out of it, but didn't hear 'Back To My Roots' until years later. So I'm surprised this one was more successful locally, though it is a better song. Thankfully, I'd never heard the Billy Ray Cyrus song before. I hadn't heard 'Bullet In the Head' before either. Rage aired an interlude when it was in the top 60. I was a bit surprised by 'The Floor''s success here - not that it wasn't deserved. It's a bop! 'Come Undone' took a while to take off locally, being released back in early May. Possibly my favourite song of theirs, I love the female vocals on it, which remind me of Kate Bush. 'Three Little Pigs' was awful, but I suppose one good thing about it was (I assume) that it was taking the piss out of 'serious' heavy rock acts like Metallica. 'What's Up' is just awful. I remember reading an interview where Linda said that she left the group because they/the record company wanted her to write another 'What's Up', but she wasn't interested in doing that (i.e. she wanted to be a more 'serious' and versatile artist)... which is funny considering what she later became.